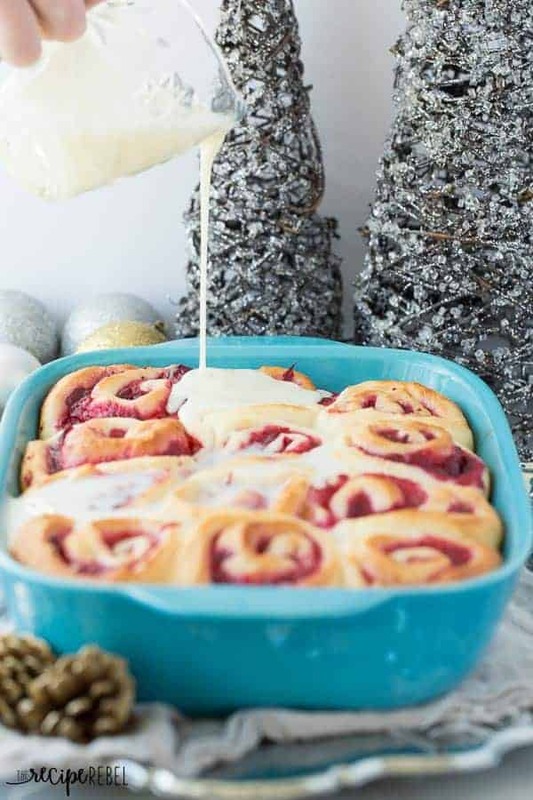 Soft, homemade bun dough filled with easy homemade cranberry filling (or sub store bought), topped with a white chocolate glaze — perfect for Christmas brunch or a make ahead weekend breakfast! I get onto a certain flavor combination and just don’t ever stop. White chocolate and cranberry is one of those combinations, pretty much as soon as October hits. I don’t know what it is, the tangy cranberry and luscious white chocolate just complement each other insanely well. White Chocolate Cranberry Cupcakes, White Chocolate Cranberry Granola Bars, Cranberry Cake with Caramel Sauce… Cranberry is one of my favorite flavors in the fall and winter, in sweet or savory recipes! Before I started this here food blog, I wasn’t really someone who invested in pretty dishes. 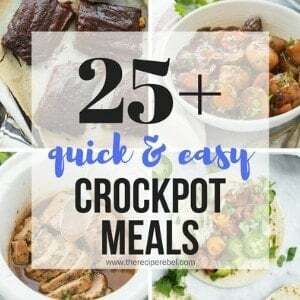 I didn’t care much about the presentation of my food and I remember my mom even frowning upon the way I place the whole slow cooker on the table once when we were having dinner. 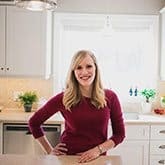 Now, obviously, I put a little more thought into how my food is presented and I have cupboards full of plates and towels and fancy cutting boards that I use when I’m preparing food for the blog (for the 3 year old and 10 month old? Not so much). So when I was offered the chance to try out the new line of CW by Corningware, I was thrilled. I have a set of the French White Corningware and they are classic, timeless pieces. The colors in the CW by Corningware line add such a fun punch of color to the dinner table, during the holidays or any day. They make every meal feel like a special occasion! 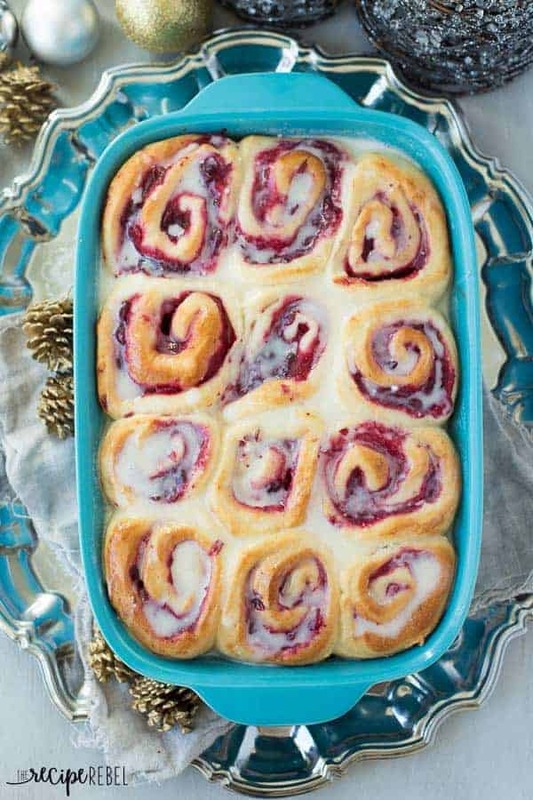 If you’re not really into cranberries or white chocolate, I think you’d still enjoy these rolls! The flavors in these rolls are mild and sweet, but if you wanted, you could substitute just about any berry in the filling and any glaze or frosting on top. I used my favorite bun dough recipe (which I always make in my stand mixer now because my bread machine broke! But that’s fine because it works just as well) to make these sweet rolls. There’s not a lot of sugar in the dough, but you’ll never miss it with that gorgeous, sweet, tangy filling and the white chocolate glaze! *I received this beautiful bakeware from World Kitchen and I was compensated monetarily for my time in creating this recipe — I’m honored to work with such incredible brands that help me to bring you more great content! 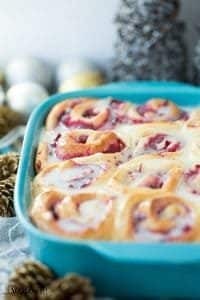 Soft, homemade bun dough filled with easy homemade cranberry filling (or sub store bought), topped with a white chocolate glaze -- perfect for Christmas brunch or a make ahead weekend breakfast! Dough:In the bowl of a stand mixer (you can do it by hand too, you'll just need a little extra muscle), combine milk, butter, sugar, yeast and eggs. Whisk to combine. Put the dough hook on the mixer. Add salt and 4 cups of flour, one cup at a time with the mixer on low. Add just enough flour so that the dough comes together in a ball away from the sides -- once it's not sticking to the sides anymore, stop adding flour (even if you haven't used all 4 cups). If you've used all 4 cups and the dough is still sticking, add a little bit of extra flour as necessary. Spray a piece of plastic wrap with non stick spray and cover the dough. Place in a somewhat warm, draft-free spot (like an oven that's not on) for 1-1.5 hours until doubled. Meanwhile, make your filling. In a medium pot, combine cranberries, water and sugar and bring to a simmer over medium high heat. Reduce to medium heat and simmer, uncovered, for 10 minutes, stirring occasionally, until cranberries have burst and are soft. Smash cranberries with the back of your spatula. Stir together corn starch and 2 teaspoons water. Stir into cranberry sauce and let thicken. Remove from heat and let cool to room temperature (you can speed this up in the fridge or freezer). Assembly: Preheat oven to 350 degrees F and lightly grease a 9x13" pan and an 8x8" pan. Place dough on a floured surface. Roll out to a rectangle about 10" by 20-24". Spread cooled cranberry filling to within 1" of the edge and roll up, starting at the long edge (be sure not to squeeze too much or you'll lose all your filling!). Slice in 1.5" slices with a serrated knife and place in your prepared pans. Place in a warm spot to rise for 20-30 minutes while the oven heats. Bake for 25-30 minutes, until the tops are light golden brown all over (even in the middle). Remove from the oven and make your glaze. Glaze:In a medium bowl, combine white chocolate and cream. Microwave on high for 1 minute, then stir until chocolate is smooth and melted. Whisk in powdered sugar, adding a bit more if necessary to reach desired consistency (knowing that it will thicken somewhat as it cools). My glaze was pretty thin, and it soaked into all the cracks and crevices. If you prefer a thicker glaze, simply add more powdered sugar. Drizzle over warm rolls. 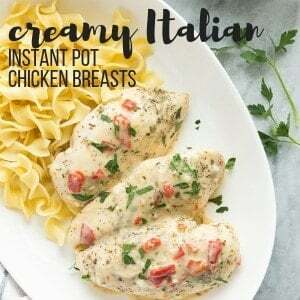 Be sure to sneak one out of the pan immediately! Rolls can be stored at room temperature for 2-3 days, in the fridge for up to a week, or freeze for longer storage. *To make ahead: prepare up until the second rise. Cover with plastic wrap and place in the fridge up to 24 hours before proceeding to bake as recipe directs. In the bowl of a stand mixer (you can do it by hand too, you’ll just need a little extra muscle), combine milk, butter, sugar, yeast and eggs. Whisk to combine. Put the dough hook on the mixer. Add salt and 4 cups of flour, one cup at a time with the mixer on low. Add just enough flour so that the dough comes together in a ball away from the sides — once it’s not sticking to the sides anymore, stop adding flour (even if you haven’t used all 4 cups). If you’ve used all 4 cups and the dough is still sticking, add a little bit of extra flour as necessary. Spray a piece of plastic wrap with non stick spray and cover the dough. Place in a somewhat warm, draft-free spot (like an oven that’s not on) for 1-1.5 hours until doubled. Preheat oven to 350 degrees F and lightly grease a 9×13″ pan and an 8×8″ pan. Place dough on a floured surface. Roll out to a rectangle about 10″ by 20-24″. Spread cooled cranberry filling to within 1″ of the edge and roll up, starting at the long edge (be sure not to squeeze too much or you’ll lose all your filling!). Slice in 1.5″ slices with a serrated knife and place in your prepared pans. Place in a warm spot to rise for 20-30 minutes while the oven heats. In a medium bowl, combine white chocolate and cream. Microwave on high for 1 minute, then stir until chocolate is smooth and melted. Whisk in powdered sugar, adding a bit more if necessary to reach desired consistency (knowing that it will thicken somewhat as it cools). My glaze was pretty thin, and it soaked into all the cracks and crevices. If you prefer a thicker glaze, simply add more powdered sugar. More great White Chocolate Cranberry recipes! 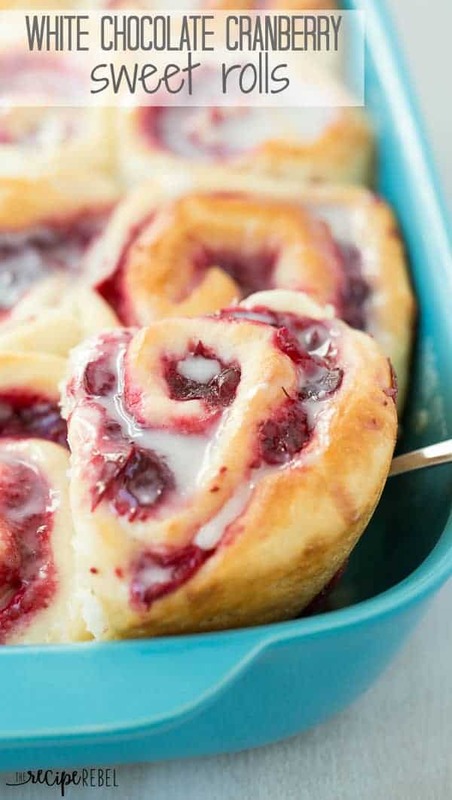 Love this combination of cranberry and white chocolate in a sweet roll, that would be amazing! Perfect for Christmas! Also, I LOVE your photos! So pretty, and the little Christmas trees in the background are so cute! Ga ga over these! Seriously. That white chocolate drizzle has me clawing at the computer screen! Cranberry and white chocolate is one of my favorite festive flavor combinations, too! These rolls look absolutely unbelievable – that white chocolate glaze!! And the blue baking dish looks so lovely! Love the white chocolate cranberry combo this time of year! These sweet rolls look incredible! How can someone not be into cranberries or white chocolate? That’s not a life I want to live. These rolls look amazing!!! Ashley, I love these sweet rolls!!! Just what I need for a holiday weekend brunch! love the white chocolate and cranberry combo!!! Thanks Alice! It’s one of my favorites! These are absolutely stunning! White Chocolate?? Cranberry?? YUM. These sweet rolls are gorgeous Ashley! I love your pictures and that Corningware! Ashley! These rolls look INCREDIBLE! You’ve outdone yourself girl! Pinned. Yes!! White chocolate and cranberry are an awesome combo!! These sweet rolls seriously look AMAZING. I can practically smell them baking. 🙂 Perfect Thanksgiving morning breakfast! These sweet rolls are making me SO excited for Christmas! Those red cranberries in there are just so dang pretty. Thanks Natalie! I can’t get enough cranberries lately! I totally wish I had one of these sweet rolls right now. Cranberry and white chocolate go great together. I bet they’re delicious! Thanks Dorothy! I had so much fun making them — my freezer is loaded with cranberries these days! White chocolate and cranberries are a total match made in heaven! That combo in a sweet roll? Holy cow, GIVE ME THAT! These are absolutely beautiful and I can imagine crazy delicious! 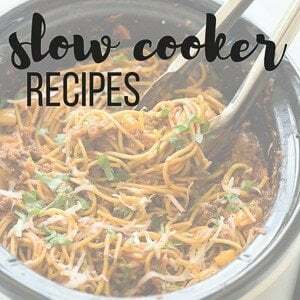 So perfect for house guests over the holidays… but of course I will have to make an entire pan just for myself! Pinned! Side Note: I have to check out the CW by Corningware line because that pan is gorgeous! Love that color! Cheers, girlie! You do! It makes everything more fun 🙂 Thanks Cheyanne! Ooooo I wish I had a few of these with my coffee this morning 🙂 Don’t worry, my mom still raises her eyebrows when I serve dinner in the pots and I don’t transfer them to dishes… errrr…. I mean that’s more dishes! Ok so I’m sort of obsessed with these!! They sound SO amazing…white chocolate and cranberry is the perfect winter flavor combo. I also LOVE how you styled this shoot! So fun and Christmas-y, and that blue dish is so gorgeous! I can never resist cranberry anything, so I’m loving your recipes, Ashley! White chocolate and cranberry is one of my favorite holiday combos. This sound so amazing when combined into a sweet roll. What a perfect breakfast or dessert!